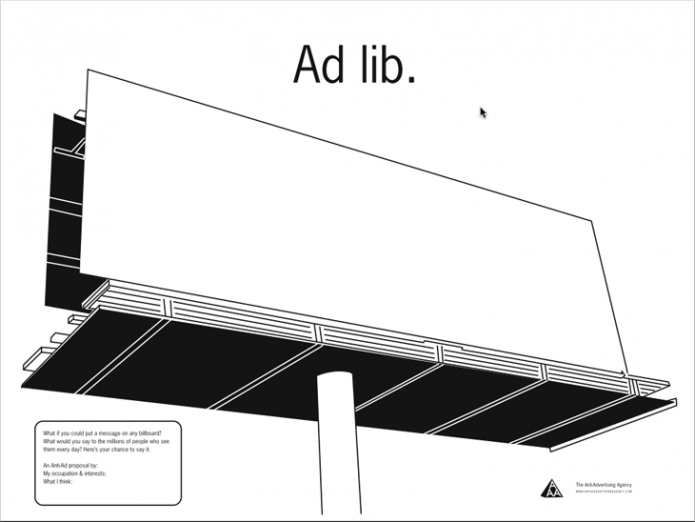 The Anti-Advertising Agency borrows the structure and methods of an advertising agency, but creates art works which critically examine the role of advertising in everyday life. I am the Agency’s “CEO” and collaborators fill other roles in the Agency. For example, The SF Print Collective serves as a “board of directors” and artist/collaborators are “creative directors” for their respective campaigns. The various sub-project campaigns are a collaboration between myself and other artists including Adam Connelly, the San Francisco Print Collective, Sara Dierck, Michael Dodge, Packard Jennings, Josh MacPhee, Dara Greenwald, Susan Greene, and Amanda Eicher. In 2005 I was given a show at the McBean Project Space at the San Francisco Art Institute. We used the space to set up an office for the Agency. Pictures and writing about the installation can be seen on the Our Offices area of the Anti-Advertising Agency website. The project is paid for through a grant from the Creative Work Fund. I was interviewed in Newsweek magazine. There’s info over on the AAA site press area. I was interviewed on Neighborhood Public Radio. It’s an archived mp3 on their site. Take a listen and let me know what you think. Wooster Collective did a profile of me and my work. It’s a huge site that covers street art from all over the world. 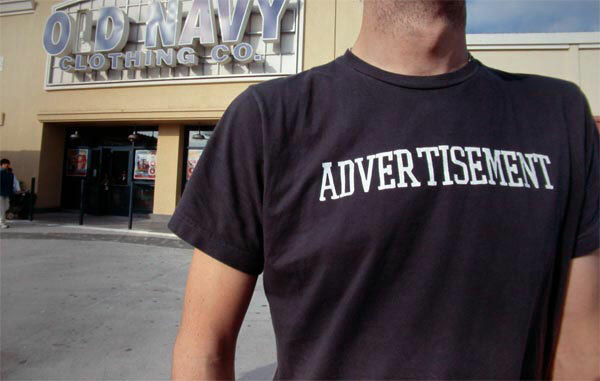 After years of work the Anti-Advertising Agency has been funded by the kind folks at the Creative Work Fund. It was an honor to be recognized among so many artists who I respect, and even some of whom I was a student. This fund gives annual grants and is great resource. If you are an artist with an interesting project that involves collaboration, look into it. 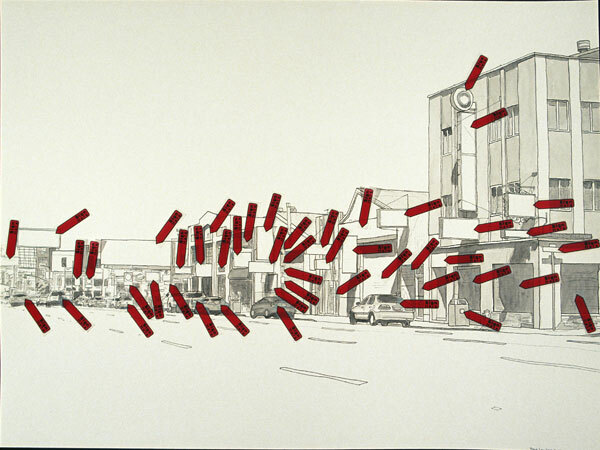 These drawings examine some of the unavoidable visual content absorbed in everyday life. All drawings are ink and watercolor on paper with Post-it brand ‘sign here’ tags attached. This series is of locations in San Francisco. Most are 18×24 inches watercolor and ink on paper, except for the framed one below which is approximately 3 by 5 feet. I created these shirts while teaching at a high school where students wore logo and company names on their chest with pride. I made dozens of them and sold them through this site for about a year. They made their way across the country and are still worn by some die-hards.